Green Holiday Gift Guide: Eco-Gifts for Little Kids! Struggling to find the perfect eco-gift for your little ones that’s not only tons of fun, but also educates and inspires creativity? We’ve got you covered! Check out Inhabitots’ brand new selections in Inhabitat’s Green Holiday Gift Guide that will keep your kids happy, active and un-glued to screens. From an amazing transforming cardboard pet ‘dog’, to Montessori and Waldorf-inspired games, all of the gifts on our list are sure to bring joy to your little tot, while encouraging cognitive and imaginative play. Struggling to find the perfect eco-gift for your little ones that's not only tons of fun, but also educates and inspires creativity? We've got you covered! 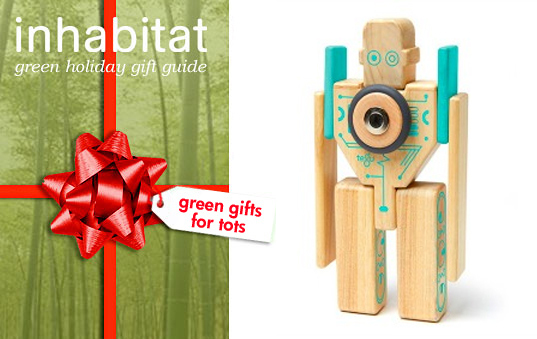 Check out Inhabitots' brand new selections in Inhabitat's Green Holiday Gift Guide that will keep your kids happy, active and un-glued to screens. From an amazing transforming cardboard pet 'dog', to Montessori and Waldorf-inspired games, all of the gifts on our list are sure to bring joy to your little tot, while encouraging cognitive and imaginative play.